This interview is part of the larger series about Performance Enhancing Visual Effects. Zbigniew Stencel is a Polish film editor. He worked on recently released No Panic, With A Hint of Histeria, and Czułość, which is going to arrive to the cinemas somewhere in the first quarter of 2016. Read on what he has to say about PEVs. My name is Zbigniew Stencel. I’m an editor based in Poland. I graduated from the Polish National Film, Television and Theatre School in Łódź (specialization in film editing), I have cut documentaries, music videos and ads. During recent years I focused on various 3D stereoscopic projects. Just now I edited two feature films. How did you first learn about Performance Enhancing Visual Effects (PEVs)? I guess Kirk Baxter, Angus Wall and Alan Edward Bell got me inspired. I read and watched various interviews and videos with them, where they described the process. But I used these kind of effects intuitively before. I thought it was cheating – and I was ashamed that I couldn’t find a “proper” editing solution to a problem in the movie. I was taught to always find a way using a simple cut, not to resort to “tricks”. When I learned about PEVs I was relieved, that maybe it’s not cheating – that it is the evolution of editing techniques. I think using PEVs gets editing even closer to directing. Could you describe PEVs in your own words? PEVs are techniques of merging audiovisual elements of film that are at editor’s disposal. It’s mainly visual elements, but I extend that to audio, with all the ways that sound can help “sell” a shot or a scene. It’s the synthesis of what was shot on set but not at the same time. It’s a collage with consistency. PEVs create what was intended on set but never happened there. Can you recall the first time you used these effects, and can you tell us what your thought process was at that time? I guess it was one of the films in film school. Two characters were sitting on a bench. I wanted to hold a shot of them sitting for a little longer, but one of the characters got up and walked away. I did a split screen with slowdown on this moving character, so the two of them sat together a little longer. It looked acceptable, so I left it in the movie. I too have heard of PEVs referred to as “tricks” not related to storytelling even by experienced editors. Where do you think this perception might come from? Is it the unfamiliarity with the technique, a misunderstanding, or is there something more to it? Experienced editors might think that PEVs will replace basic skills and techniques of storytelling in film editing. PEVs are expansion of our skill set. 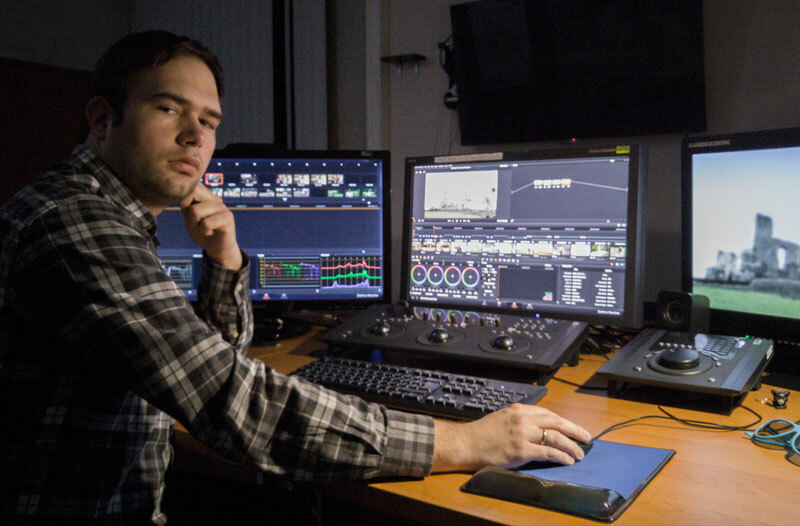 Maybe some not tech-savvy editors are afraid that these techniques are difficult, or that the “classic-NLE” means of editing will become obsolete. I think any problem can be resolved with simple cuts and make particular thing work in the movie. With PEVs we can not only make something work in the edit, but make it look better. You said that PEVs make editing more like directing. This is a very astute observation. Can you elaborate on that? When you make some actors do things that they didn’t do on set, you’re stepping into the shoes of the director. Using PEVs is like doing a re-shoot. In most cases PEVs help with problematic situations with actors in the footage. Directors and actors are very close on set, but in the editing bay the intimacy starts to grow between the footage and editors. This relationship is not as direct as its counterpart on set, but editors are still “saying” to actors “do this, do that” with cuts, and even more with PEVs. Zbigniew in his editing/grading suite. He decided to avoid showing his favourite NLE – because he loves and knows them all. Do PEVs influence the way you approach editing? I try to use PEVs as the last resort. I dive into the footage to find what I may have omitted, to look at it from a different perspective, to find gems. Only when I’m sure I will not find what I’m looking for, I use PEVs. It would be lazy to use PEVs before that. All those editors in the history of cinema resolved difficult situations with their creativity – we cannot lower our standards and standards of our profession. Does the knowledge and ability to perform PEVs allow you to be a better editor and tell better stories? It’s always about telling a better story. Be it PEVs, transitions, effects – they all should serve the story. Cliché, but that’s what I think. But I’m a fan of a simple cut. I’m more proud of myself, when I resolve a problem with straight cuts than with PEVs. Do PEVs change the way you look at the footage and think about it? Yes, but I try to use “PEVs perspective” on footage only when all other ways of problem solving in editing failed. When I see the footage for the first time I’m not automatically analyzing “Here I will use split-screen, here I will do a slowdown and add a mask”. All these ideas come later if they’re really required. What differentiates PEVs from the “true” editing? I think PEVs don’t make the editing any less “true”. But maybe cutting on Steenbeck, KEM or Moviola was “true” editing. It was all about cuts. Any dissolves involved sending a cut to laboratory, not mentioning more difficult processes. I was editing on Steenbeck for a year in film school and I thought about simple cuts, not masks, slowdowns, cloning or repositions. So maybe the “true edit” is something that was available almost since the dawn of cinema: a cut. Do you think PEVs should be taught to new editors in film schools? To what extent? When students understand the basic principles of editing and they can solve issues with techniques known to the editors in the era of film – then yes, they should be taught to use PEVs. But in the first years of education, maybe, just maybe, they should be forbidden to use them. Do PEVs influence your relationship with the director? Yes. At first, the directors were hesitant to use this technique. They didn’t know that the tools were in an NLE. After few shots done this way which looked good, they were like: let’s merge this part of this take with the other shot into one. If I wasn’t sure that I searched through all the footage for particular scene or sequence I didn’t agree to use PEVs. How often are you using PEVs? I try to minimize the use of this technique, as I explained before. It can range from 5 to 15 shots in a movie. How much are you doing yourself, and how much is passed to the VFX team? I’m doing an offline version with offline resolution footage in an NLE. VFX guys get online resolution clips and they’re doing the final shot. I have to be sure to pass all the necessary metadata and references so that they can recreate what was approved in the offline. So the idea is created in editing room but it’s realized by the VFX department. What was your simplest shot that you created? I think that it was the one created in film school, still intuitively. I like these kind of simple treatments, but my ambition is to create – if a film I am editing requires it – some PEVs with face replacement or roto to smoothly add body parts. These kind of manipulations are still not my league. Can you tell us about your most complex shot? It was a reaction shot of six people. In each take they weren’t synchronized in their movements. I had to merge their reactions so they would turn their heads and bodies at the same time. The shot was static, but you had to compensate for slight differences in camera position and positions of the actors. It’s not that hard technically, but the choice of particular takes and timing is crucial. Of course, the VFX team made it even better. And the most satisfying one? The most complex shots are the most satisfying ones. How much time do you spend on a shot? From a few minutes to half an hour at the most. The time is precious in the editing bay so If I can’t achieve it in the short time I just make it less polished and leave it for the VFX team. Sometimes shots are more complicated, so NLE tools are not enough. What kind of tools do you use to make PEVs in your daily work? In today’s post production world there is no comfort in knowing only one NLE. So I use the one that’s desired for particular project. Inside Media Composer there’s the Animatte effect. Inside Premiere Pro – masks, that are now very nicely built into clips effects controls and other effects. In Final Cut Pro X – the Draw Mask effect. I also use retiming on selected composited shots – my favorite is FluidMotion retiming in Media Composer. So masks and retiming are basic tools for PEVs. Tagged Performance Enhancing Visual Effects, PEVs, visual effects. Bookmark the permalink.